Laing is a Filipino dish of shredded or whole taro leaves with meat or seafood cooked in thick coconut milk spiced with labuyo chili, lemongrass, garlic, shallots, ginger, and shrimp paste. It originates from the Bicol Region, where it is known simply as pinangat. Laing is also a type of ginataan (Filipino dishes cooked in coconut milk), and thus may also be referred to as ginataang laing. Laing is eaten paired with white rice or bread. It is also commonly eaten as a side dish to meat. Laing is the name of the dish in most parts of the Philippines, but it is more commonly known as pinangat in the Bicol region where it originated. However, the name can be confused with pinangat na isda, which is a different dish made with fish cooked in a slightly sour broth similar to sinigang. The confusion stems from the original meaning of the verb pangat in the languages of Southern Luzon, which simply means to cook fish or meat in a broth of water and salt. Laing is typical of Bicolano cuisine, which is known for their common use of chilis and coconut milk. Laing is also known as ginataang laing, pinangat na laing, and pinangat na gabi, among other names. The original laing from the Bicol Region does not use shredded taro leaves, but rather a whole taro leaf (natong in Bicolano). This version is the one most commonly referred to as pinangat. The mixture usually consists of cubed pre-cooked pork, shrimp, or fish flakes (or all three) with bagoong alamang (shrimp paste), crushed labuyo chili, garlic, shallots, ginger, and kakang gata (coconut cream). It is wrapped with the leaf and tied with a coconut leaf midrib or twine. It is then steamed in gata (coconut milk) with a knot of tanglad (lemongrass) until the leaf pouches are fork tender and the coconut milk is reduced to a thick sauce. For the laing version served in Manila and elsewhere, it is cooked similarly, but with the leaves shredded. It also usually includes chopped leaf stalks. Laing is usually eaten with white rice, but it can also be eaten sandwiched in bread like pandesal or used as a stuffing for other dishes. It is also commonly eaten as a side dish to meat. The taro leaves to be used for laing must be prepared correctly, as they contain amounts of calcium oxalate crystals (raphides) that can sometimes cause itching and burning sensations in the mouth. They are usually washed and cooked thoroughly to avoid this. Drying can also lessen the amount of crystals. Inulukan or inulokan is a variant of laing made from the meat of river crabs (uluk or ulok) wrapped in whole taro leaves and cooked in coconut milk spiced with calamansi, black pepper, and lemongrass. It is a specialty of Camalig, Albay. It is also known as pinangat na ugama or pinangat na talangka, from ugama and talangka, other local terms for river crabs. Tinumok, tinomok, or tinulmok is another traditional variant from Bicol which uses whole taro leaves wrapped around a mixture of freshwater shrimp, fish flakes (and sometimes meat), shrimp paste, with minced or grated coconut meat, onions, chilis, lemongrass, garlic, and other spices cooked in coconut milk. It differs primarily in its use of coconut meat. Wikimedia Commons has media related to Laing (food). ^ "Last night's dinner: Pinangat". God Antifornicator. Retrieved 10 January 2019. ^ a b c "Laing (Pinangat) and Bicol Express". TheLoneRider.com. Retrieved 10 January 2019. 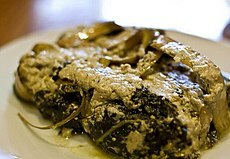 ^ "Pinangat & Laing - Another Famous Bicol Treats". Touring Bicol. Retrieved 10 January 2019. ^ Polistico, Edgie (2017). Philippine Food, Cooking, & Dining Dictionary. Anvil Publishing, Incorporated. ISBN 9786214200870. ^ "pangat". Tagalog-Dictionary.com. Retrieved 10 January 2019. ^ a b "Laing". Kawaling Pinoy. Retrieved 10 January 2019. ^ a b "Pinangat na gabi". Philippines Travel Guide. Retrieved 10 January 2019. ^ de Leon, Mack. "Pinangat Recipe". Yummy.ph. Retrieved 10 January 2019. ^ "Pinangat a la Josephine". Market Manila. Retrieved 10 January 2019. ^ "7 dishes to try on your next roadtrip to Albay". GMA News Online. Retrieved 10 January 2019. ^ "Oyster omelette to 'pinangat' burgers: 8 must-try dishes at the World Street Food Jamboree". InterAksyon. Retrieved 10 January 2019. ^ "Inulukan and Pinangat: Do they have differences?". SeanSusan. Retrieved 10 January 2019. ^ "Quick Facts on Camalig". Amazing Albay. Retrieved 10 January 2019. ^ "Tinumok of Bicol". Atbp.ph. Retrieved 10 January 2019. ^ "Tinumok (Shrimp Mixture Wrap in Taro Leaves)". Panlasang Pinoy Meaty Recipes. Retrieved 10 January 2019. ^ "Tinomok". Chewing My Way Through College. Retrieved 10 January 2019. ^ "Tinumok". The Glorious Food Glossary. Retrieved 10 January 2019. This page was last edited on 14 January 2019, at 22:16 (UTC).